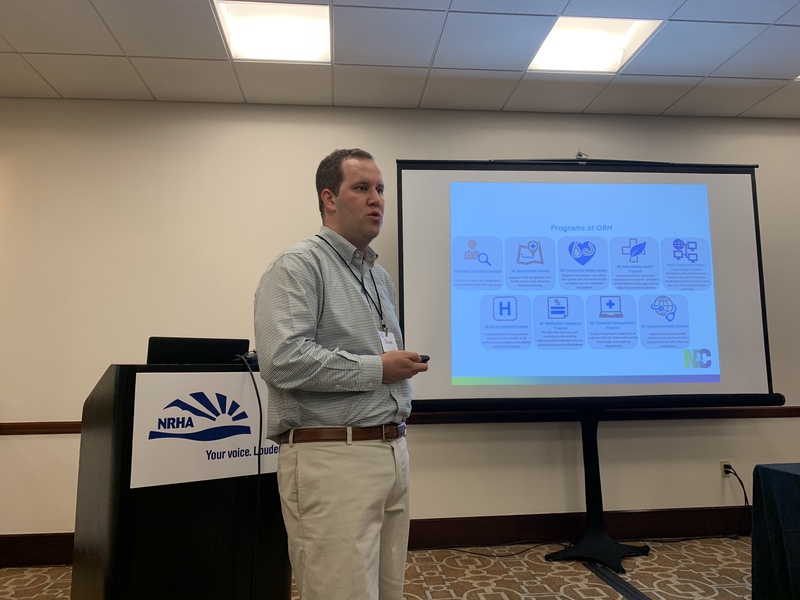 Shannon Chambers (SC), Robert Coble (NC) and Tammy Norville, NOSORH Technical Assistance Director, spoke to a standing-room only group at the NRHA 2018 RHC Conference in Kansas City, MO in late September. They spoke on how Rural Health Clinics (RHCs) might work with their State Office of Rural Health. Norville provided an overview and context of NOSORH and general SORH information including organizational structures, examples of services provided and National Rural Health Day. Chambers brought the presentation full circle with her discussion of services provided to RHCs through the South Carolina Office of Rural Health (SC ORH). She discussed the outreach strategies SC ORH uses to encourage RHC participation, keeping them informed while protecting their inboxes from “overuse”. Thanks to these presenters for their willingness to share their expertise and experience. Register now for the Rural Health Clinic Institute, a 9-part webinar series developed by NOSORH to help State Offices of Rural Health (SORH) build capacity to provide technical assistance to clinics in their states. SORH will learn about the needs of RHCs, compliance issues for RHCs, how to support RHCs to do better billing and collection, ways to help RHCs become innovative, and how to organize their office’s efforts so that they can be effective technical assistance providers for RHCs. NOSORH will offer an optional RHC Institute “Kick-Off” session at the National Association of Rural Health Clinics (NARHC) Spring Institute in San Antonio on Sunday, March 18th from 5:30-7:30 pm. This in-person session is for registrants of the Institute only and will serve as a primer for SORH to gain a basic understanding of RHCs. Following the “Kick-Off”, NOSORH will launch the Institute webinars on April 3. View the RHC Institute flyer for more details and an outline of the curriculum. Click here to register for the Institute. Registration ends on March 16 and class size is limited. The registration fee is $500. 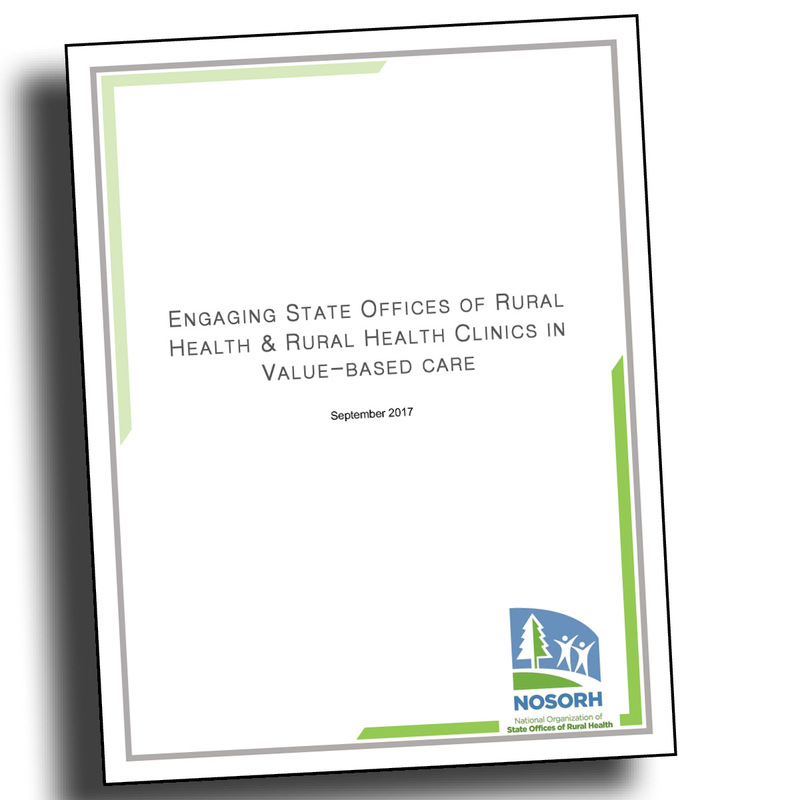 The NOSORH Rural Health Clinic (RHC) Committee has released the latest module in a series designed to assist State Offices of Rural Health with providing technical assistance for Rural Health Clinics (RHCs). 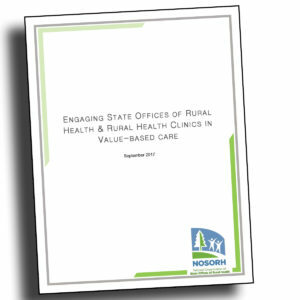 Engaging State Offices of Rural Health and Rural Health Clinics in Value-Based Care aims to define what delivery system reform means, focuses on payment reform, and includes care coordination and strategic collaboration initiatives for RHCs. RHCs across the United States are faced with the growing need to adapt to new initiatives, payment structures, and value-based systems in order to make the move from volume to value. The main challenges RHCs face are the potential administrative burdens, financial risk, and few opportunities for reimbursement. This module will guide SORHs on their role in this effort to assist RHCs as they adopt new policies and procedures to implement value-based care initiatives. The module includes information on Medicaid initiatives, primary care models and the future of delivery system reform, plus SORH examples across the nation. Join the webinar Engaging RHCs in Value-Based Care on Tuesday, October 31 at 3:00 pm EASTERN to learn more about the toolkit, the latest trends on the federal level for value-based care initiatives for RHCs and a SORH example of engaging RHCs. For more information on the webinar, view the flyer here. All modules in this series can be found here. NOSORH has partnered with Lilypad, LLC to implement the Practice Operations National Database (POND) program, a web-based data collection, reporting and benchmarking application for rural primary care providers. POND provides a unique data set focused on rural relevant financial, operational, productivity and compensation measures for which no systematic data sets currently exists. Engage with RHCs to provide access to comparative analytics to contribute to understanding current rural provider performance. Facilitate sharing of best practices and provide data for more effective contracting and operational improvement. Offer technical assistance for physician practice management and recruitment and retention best practices. POND provides an easy, consistent approach to engage RHCs and other primary care providers. It can also be used to promote community between FQHCs and RHCs through data-based discussions and can establish the SORH as a source of relevant and unique resources. Watch this video to learn more about POND and find more information on the POND website. Click here to enroll in POND. Annual fees for SORHs are $2500 for states with fewer than 90 RHCs and $3500 for states with more than 90 RHCs. This annual fee enables all rural primary care practices in your state to participate in POND. If you have any additional questions, contact Kassie Clarke at kassiec@nosorh.org. Awards – The Awards Committee, co-chaired by Margaret Brockman and Cathleen McElligott, will be starting up again soon to plan for the 2016 NOSORH awards program. Board– The NOSORH board met April 25 to review strategic priorities on policy, RHC work, National Rural Health Day, development and policy and program monitoring. The board approved the grant budget for 2016-17 and learned that three states (Wyoming, Texas and Nevada) are interested in hosting future annual meetings. Earlier in the month, the Board approved revised suggested language for legislation to support reauthorization of the SORH program. Communications – The Communications Committee is planning for the 2016 National Rural Health Day (NRHD), including crafting a new logo. The NRHD kickoff webinar is schedule for May 25 at 3:00 EDT. Development – The Development Committee provided final input on promotional materials for the 25th Anniversary of the SORH grant program, including a logo and video template. These materials will be available to interested SORHs in May. Flex – The Flex Committee kept the conversation brief this month while everyone is working to complete their Flex applications due May 16. Sarah Young announced she is taking the role of FORHP Flex Coordinator. PPMT – The Team is working with Harvey Licht to review input for a CMS request for information on global budgeting. All SORH were invited to a webinar discussion on PPMT activities last week, including the need to reach out to Medicaid Directors as they are required state plans for monitoring in October. To listen in on the conversation and plans for making comments click here. Watch your email for more information. RHC – The RHC Committee reviewed the RHC Institute and RHC Virtual Conference evaluations and decided to offer the RHC Institute again next Spring and open the RHC Virtual Conference to RHCs in the Fall. The Committee is also working on a toolkit to engage RHCs in healthcare reform. NOSORH released two new resources and hosted a successful RHC Virtual Conference last week discussing the 2 new modules from the RHC Committee. You can access the webinar recordings on quality, behavioral health and improving performance and the new modules on the NOSORH website. These modules focus on providing technical assistance to RHCs regarding quality improvement activities and behavioral health integration. Two long-standing corporate partners joined on the third day to discuss assisting RHCs with operational efficiencies. “We were very happy to have such a great interest in the rural health clinic work. The modules were compiled and the webinars were planned for State Offices of Rural Health. 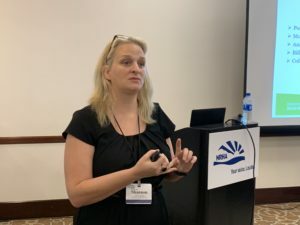 We know rural health clinics need education on these issues and plan to offer similar webinars for State Offices of Rural Health to reach out to rural health clinics in the near future,” said Kassie Clarke, NOSORH Technical Assistance Director. The Rural Health Clinic (RHC) Committee began in 2009 as a task force to assess what types of support SORHs were providing for RHCs. The task forced evolved into the RHC Committee in 2013 to focus on providing education for SORHs that are interested in providing technical assistance to RHCs and safety net providers. “The RHC Committee is a great place for SORH to learn more about Rural Health Clinics and how they can support them. It’s also a great venue to ask questions about RHCs and voice RHC related concerns,” explains Stephanie Hansen, NOSORH Director of Education Services. The Committee is currently working on 3 new toolkit modules for quality, behavioral health, and engagement in RHCs. They helped design the first RHC Institute to begin in October and encouraged the offering of a RHC 101 workshop to be held at the Annual Meeting on September 3rd in Portland, OR. They also suggested the RHC Institute coordinate with the National Association of Rural Health Clinics to increase collaboration. 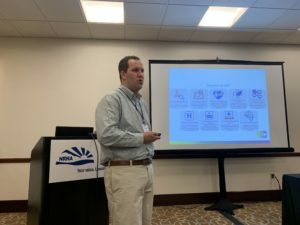 “The NOSORH RHC Committee is comprised of an engaging and passionate group of individuals who are focusing SORH resources on the certified RHCs within their state. The committee calls consist of state-sharing which is extremely valuable. In addition, three standing items on the agenda include a Policy and Regulatory Update from Bill Finerfrock, updates from the Office of Rural Health Policy, and updates from John Gale regarding RHC research. These updates are excellent opportunities to stay abreast of what is happening in the RHC world,” says Co-Chair Crystal Barter. The Committee meets every other month on the third Monday at 2:00 Eastern. The next call is scheduled for August 17th at 2 pm ET. Contact Co-Chairs Tammy Norville and Crystal Barter for more information on joining the RHC Committee.